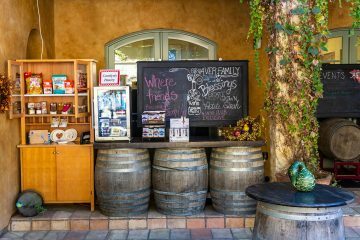 We were experiencing the wineries of the Santa Clara Valley for the first time, already having wonderful tastings at the Guglielmo Winery, Morgan Hill Cellars, and the Jason Stephens Winery. 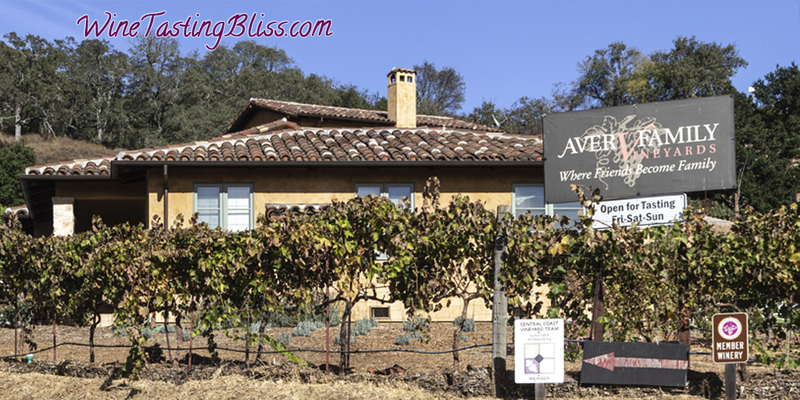 With understandably high expectations, we drove up the hill a bit to the Aver Family Vineyards. Enjoying a triumph of clear signage, we parked in the expansive “tasters only” lot and strolled up the path toward the tasting room. 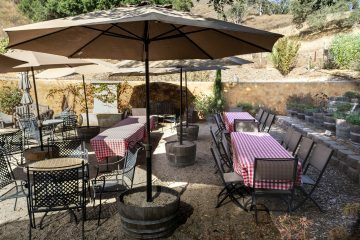 We walked past a patio area with umbrella tables to find a tasting bar with an incredible view of a sloping hillside covered in grape vines. 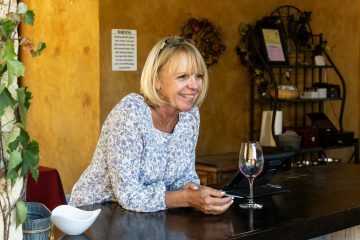 We were immediately greeted by wine guide Cindy, who got us set up for our tasting flight and gave us a bit of background on the winery. 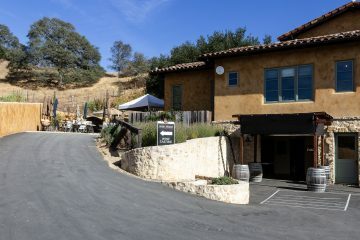 We learned that owners John and Carolyn Aver, after successful careers in Silicon Valley, purchased the property in 2005 and have been transforming the vineyards to fit their vision ever since. Cindy started our tasting with their 2016 “Benevolent” Viognier. The name Benevolent is in honor of Carolyn’s mother, Theresia, who was known for her good works and kindness toward others. We enjoyed the wine’s mango and lemon zest notes as they danced across our tongue. Their 2017 “Family Album” Rosé was an immediate hit with us both. The label featured a picture of Carolyn’s parents at their 1953 wedding. We found apple blossoms on the nose with flavors of Oregon cherry and strawberry, leaving a wonderful, rounded fruit finish. Our Take Home list was inaugurated! The winning streak continued with their 2015 “Family Album” Carignane. This time, the family photo on the label showed one of their brothers, proudly wearing his Raiders jersey. We loved the amazing cascade of fruit, featuring dark cherry and pomegranate, with just the right level of spice toward the finish. As we admired this wine, Carolyn and John joined us. What a treat! 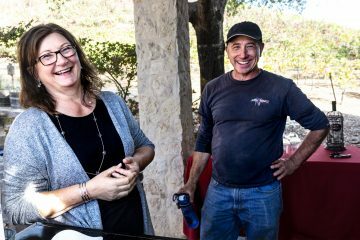 Hearing directly from the winery owners is always a privilege and we were so grateful for their time and attention, especially during such a busy season. It was clear that John’s passion was the vineyard. 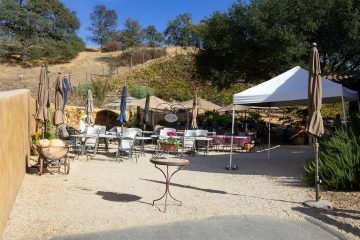 He spoke in glowing terms about the year-by-year transitions that he has accomplished in the hillside vineyard. 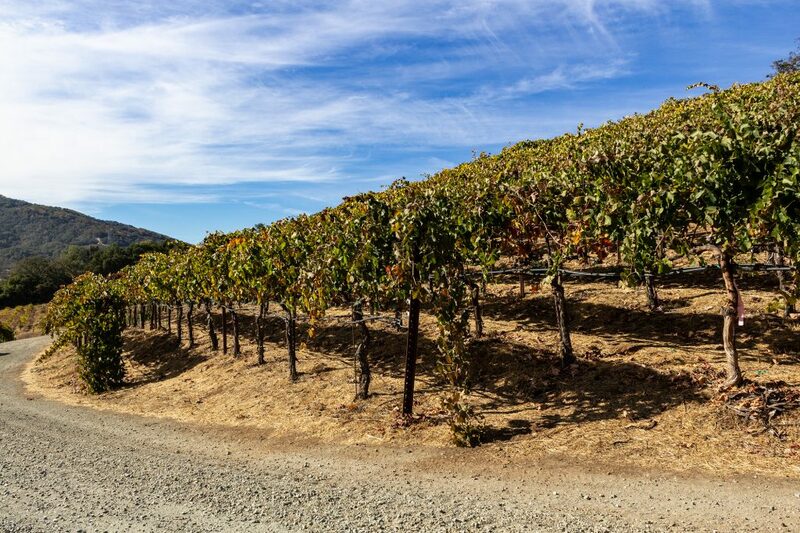 When they purchased the property, it was planted in Petite Sirah, Cabernet and Syrah. 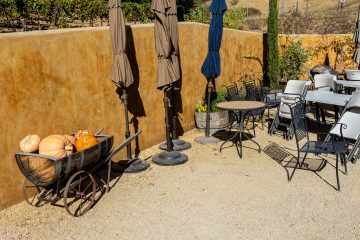 Over time, he has added Grenache and Mourvèdre to the mix. John also spoke enthusiastically about the skills of Kian Tavakoli, their winemaker. Kian’s resumé includes Opus One and Clos Du Val., and judging by our tasting flight, they form a very capable team! We next tasted their 2014 “Faith” Petite Sirah. 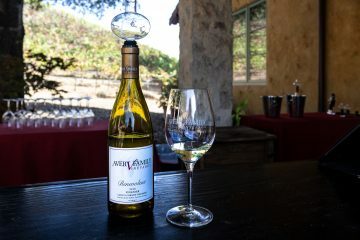 The name “Faith” reflects the leap of faith that the Avers took when they started Aver Family Vineyards. A blend of 58% Petite Sirah, 39% Syrah, and 3% Carignane, we put this at the top of Take Home list based on the balanced and nuanced blackberry and dark cherry notes and the deft kiss of tannins on the finish. This wine will become legend. Our penultimate taste was their 2015 “Hope” Rhône Blend. Made from 55% Grenache, 27%, Syrah, 15% Mourvèdre, 2% Petite Sirah, and 1% Carignane, this was a festival of dark fruit, with an earthy and peppery finish. When discussing the importance of Hope, Carolyn spoke of the wildfire of 2009, when a lightening strike set the entire ridge ablaze. The Avers were profoundly grateful for the firefighters who battled the fire as it crept down the ridge, to stop at the very edge of their property, saving their home. We all raised a glass in their honor. Our final taste was their 2014 “Heritage” Cabernet Sauvignon. Honoring both Carolyn’s and John’s fathers, this Cab included a splash of Merlot and showed the elegance and restraint that is required for a fine Cabernet Sauvignon. Well done, Kian! Smooth and full of personality, every sip caused an immediate need for another sip. After learning a bit about the exciting European cruise they will be leading next summer (there may be cabins left), we totaled up our Take Home list and thanked Cindy, Carolyn and John for a memorable experience. We can’t wait to return! Have you visited Aver Family? Click to give'em a tweet of support!